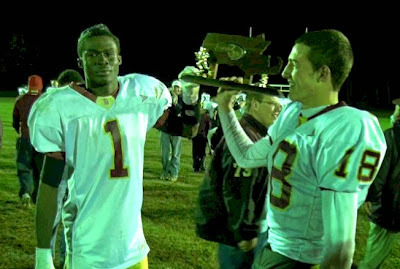 Doherty WR/S Isaac Yiadom (1) and QB Luke Brennan (18) holding the CMass D4 trophy. Look, my story on Doherty's thrilling, come-from-behind, last-minute touchdown pass off a broken play, breaking a 33-year championship drought, story is already up on ESPN Boston. I'd suggest giving that a read, but if you want some more of my thoughts, and some pretty amazing highlights, keep reading after the jump. Here they are... You should check 'em out. So yeah, as I said, the Highlanders made some history with their 32-28 win over Shepherd Hill. It was Doherty's first Central Mass championship since 1980, and coach Sean Mulcahy would know. He was a sophomore playing for Doherty back then, and here is the obligatory "list of things that have happened since/things that happened in 1980." -The world's population has grown by over 2.5 billion. -Four Terminator Movies, Four Indiana Jones movies, four Star Wars movies and three Jurassic Park movies have been released. I don't even want to start counting all the Friday the 13th and Halloween films. -1.5 Bush's have been elected president. -John Travolta has gained 80 lbs. and lost his mind. -U2 is pretty much the same. -We learned that Freddie Mercury and George Michael were gay. We also learned that the guy who sings the "if you like pina coladas" song doesn't even like pina coladas all that much. -Gisele Bundchen was born: Wait really? Dang, she looks good for being as old as Doherty's last title team. -So was Jessica Simpson… Ok, maybe not so much. -A gallon of gas cost $1.19 and Ford Pintos were flying off showroom floors at a sticker price of $3,900. -Ronald Reagan was elected president. -Doherty's seniors were negative 15 or negative 16 years old. -We learned that Darth Vader was Luke's father in The Empire Strikes Back. -Pink Floyd's "The Wall" was the best selling album of the year. -You could still listen to Fleetwood Mac without facing public ridicule. So yeah, a lot has changed since Doherty's last title team. I've said it before, but it bears mentioning again just how big Doherty QB Luke Brennan and athlete Isaac Yiadom have come up in the biggest moments of the Highlanders' season. This time, it was Brennan evading the rush and, wisely, choosing not to throw into double coverage on a play designed for Alfred Adarkwah on the boundary side. Instead, Brennan doubled back and found a wide open Yiadom in the opposite corner of the end zone for the game winner. It was a play straight out of the 2008 Steelers playbook, and by that I mean it wasn't in anybody's playbook. Remember when Roethlisberger extended the play in Super Bowl XLIII to find Holmes in the corner of the end zone to win it all? This was the CMass equivalent. Shepherd Hill came in known as the more physical team, and the Rams certainly lived up to their reputation, especially when it came to running the ball. Still, the Highlanders were hitting hard on defense, and they weren't afraid to get a little vocal with the home team (or their crowd). That attitude carried over on two crucial plays. The first came when the Rams led 28-20 in the fourth, and could have simply kicked an extra point to go up by two scores. Instead, they decided to run it, but the Highlanders answered the bell, wrapping up Ram running back Jake Gelb at the line of scrimmage. Then, in the game's final moments, the Rams faced a 4th and 3 at the Doherty 36. They went for the win, but Doherty was again up to the challenge, knocking back the physical left side of the Shepherd Hill line and dropping the runner for only a one-yard gain. Without those two plays, the Highlanders wouldn't be champs.